Another beach day, another great read. 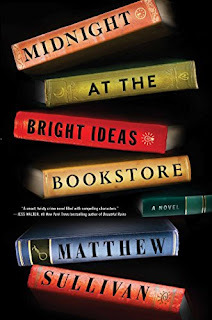 I really enjoyed Matthew Sullivan’s Midnight at the Bright Ideas Bookstore. This novel caught my eye because it has a brilliant cover and an intriguing plot involving a bookstore and a mystery. It kept my attention, but it ended up being a much heavier book than I anticipated. I should have known it would be heavy as the description tells readers it begins with a suicide committed in a bookstore by a frequent patron. However, I did not realize the novel would become an intricate mystery about a decades-old horrific murder. With that being said, I liked it! I liked the main character, Lydia, and I wanted to know more about her. I appreciated how the character we only meet through suicide still is able to tell his stories through books. The horror of the events in the past shocked me, but also intrigued me. I wanted to continue reading until all the questions were answered. I did, however, figure out who the Hammerman was earlier than the big reveal. That did not take away from wanting to read the rest of the novel. I still was shocked and satisfied by the ending. I loved the bookstore setting as any bibliophile will. I recognized the frequent visitors and the booksellers, which made the book even more enjoyable. My only complaint is that I wish the years between the horrific unsolved mystery and the present were explained in more detail. All I got was that Lydia and her father had a strained relationship. I wish this would have been developed. Lydia is very angry with her father and has not seen him in years, but it is not really explained. I imagine this is because Sullivan wanted readers to be unsure about him; however, I think some more background on the in-between years would have been helpful in understanding her character and their relationship. Overall, this is a book I definitely recommend – especially to people who love books and mysteries.